Ubisoft has yanked three of its major upcoming games from Valve's Steam service due to an apparent dispute between the two companies. Ubisoft has only given a partial explanation to PCGamesN. 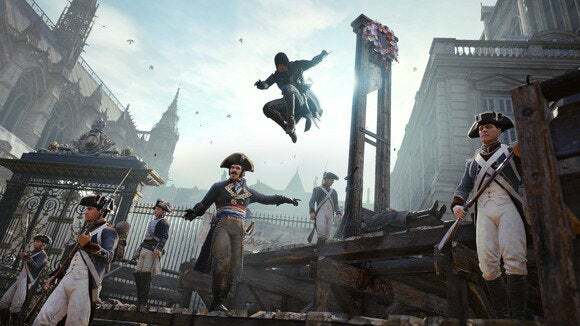 “We've been in discussions with Valve about Assassin's Creed Unity but for the time being the game is not available via Steam in the UK,” the company said in a statement. It seems likely that the removal of Ubisoft's other games across other regions is related to these “discussions,” but the company's U.S. public relations team is staying mum for now. It's possible that this is just a temporary quibble, and we can only speculate on what's actually happening. (One guess: Ubisoft wants a better deal than the apparent 30 percent cut that Valve takes from all PC game sales, and feels there's enough demand for players to seek the games out elsewhere.) But with the next Assassin's Creed due to launch on November 11, and Far Cry 4 due out the following week, there isn't much time for Valve and Ubisoft to come to terms. In lieu of Steam availability, players can buy Ubisoft games through the company's own Uplay service and through other retailers such as GameStop, Amazon, GreenManGaming, and GamersGate. They can also add non-steam games to their libraries for easier access. The impact on you at home: Even if Steam distribution was an option, players would still have to install Uplay to launch the game, as they do with current Ubisoft titles. Still, not being able to purchase through Steam creates a hassle for players who want to download and manage their games through a single service. When restoring purchases to a new PC, it's one more site users have to visit, or one more piece of software they'll have to download.